Are you a big fan of Life Of Pi? Well don’t go and get the Story Of O just because they sound similar. Instead, put your query to BookLamp, a free service/project aimed at creating a database of “like” books. Similar to Pandora, the service is based on the Book Genome Project and attempts to find books that are similar based on measurable criteria. The project, founded in 2003, is trying to figure out the “DNA” of certain books by rating them based on various characteristics. 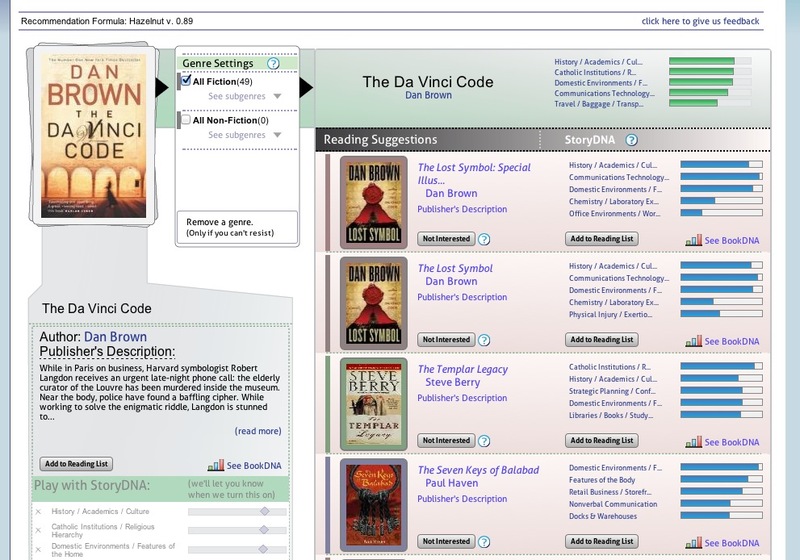 Like similar music services, BookLamp gives books different ratings based on their content. These ratings drive a recommendations engine that can For example, The DaVinci Code is filed under History/Culture, Catholic Institutions, and Travel. These traits are compared to other books and rated based on similarities. The objective nature of what we do makes the BookLamp engine impervious to marketing dollars, or author popularity. We like to say, “We’re as likely to find you Richard Bachman as we are Stephen King.” For a long time, Richard Bachman – a pen name for Stephen King – sold a lot fewer copies than the Stephen King books, because no one knew they were the same author. Now, everyone knows, but back then, Richard Bachman almost certainly wouldn’t have been easily discoverable on the social recommendations engines that exist today, any more than a human could recommend a book that they didn’t know existed. BookLamp’s approach has its own strengths and weaknesses. One of the strengths is that we treat every book equally, regardless of popularity or marketing budget, and so can pull from the long tail. Sadly, the site is still fairly incomplete as it needs many more books in order to create a complete picture of many titles. The organization is working on adding more titles as we speak, which is actually quite important as we enter the era of ereaders and book rentals. I could see services like this playing an important part in future systems for book rental recommendations a la Netflix, for example, allowing folks to read multiple titles in a genre without the hit or miss of current book discovery and marketing.